The EU Commission has admitted that EU vessels fish in Western Sahara, occupied by Morocco. Western Sahara Resource Watch demands an immediate halt to the fishing, until the agreement has been corrected to clearly exclude the territory offshore Western Sahara. In 2006, the European Community and Morocco signed a fisheries partnership agreement permitting vessels from the EU to fish offshore Moroccan waters. The agreement was controversial, since it did not specify exactly where the fishing could take place. Under the agreement, European vessels can fish in "waters falling within the sovereignty or jurisdiction of the Kingdom of Morocco". With this definition, it has become a matter of interpretation whether fishing can indeed take place in Western Sahara or not. Western Sahara has never constituted a part of Morocco, and the territory has been under illegal Moroccan occupation since 1975. No EU state have recognised the Moroccan annexation of the former Spanish colony, where most of the Moroccan fishing normally occurs. The failure to specify the precise coordinates of the fisheries agreement, has left it up to Morocco and the fishing industry to interpret where the fishing zone lies. Now the EC has provided data showing that fishing has indeed taken place in the waters off Western Sahara. This implies that international law now has been broken. "This shows that the agreement was too impresice in the first place. Now that the EU member states have been made aware of it, all fishing under the agreement must be temporarily stopped, until the agreement is duly revised. The agreement needs to be amended, so that it specifies that it is only applicable in the internationally recognised waters offshore Morocco", said Javier García Lachica, international coordinator of Western Sahara Resource Watch. "No state recognises Morocco's claims to Western Sahara, and the EC and its member states cannot let its boats operate in these occupied waters", said Garcí­a Lachica. Under European Community and general international law, the Commission is obliged to implement agreements in accordance with international law. "Its failure to ensure the exclusion of the Western Saharan waters from the application of this Fisheries Agreement could render the EC complicit in the violation of the Sahrawis' right to permanent sovereignty over their natural resources. Member States would also be liable for violation of the Sahrawis' rights", Garcí­a Lachica said. The admission was hard to get from the Commission. The revelation came only after Members of the European Parliament had asked 7 different written questions to the Commission, all with different wording and approach. The break-through came when a question was asked on 4th March 2008 by MEPs Caroline Lucas (UK), Raül Romeva (Spain) and Karin Scheele (Austria). 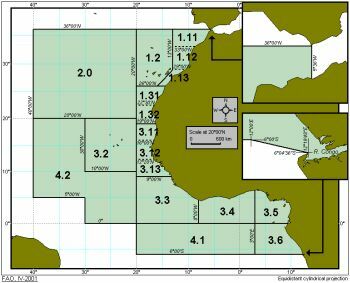 The MEPs sought information on the EU fish catches under the current agreement reported from the so-called fishing area 34.1.3 (see map to the right). Until then, whenever the Commission had been asked if EU vessels fished in the Western Sahara zone, the reply was every time that it was up to Morocco to define the area of application of the agreement. "We believe that these findings prove that Moroccan authorities have clearly disregarded their obligations under international law, and that it is EU's duty to revise the agreement so it is for the benefit for the people of Western Sahara. The agreement as stipulated and implemented today is in complete disregard of the wishes and interests of the Sahrawi people", said Javier García Lachica. WSRW urges the EU to temporarily stop all fishing, and that the European Council requests the Commission to renegotiate the territorial application of the agreement. "We demand that the agreement is amended so that it is only applicable in waters of Moroccan sovereignty and jurisdiction, clearly defining it as to be north of the parallel 27 degrees and 40 minutes", said Garcí­a Lachica. The recent published data show that at least 3 countries - Spain, Lithuania and the UK - have fished in Western Sahara waters during 2007. 11 EU states have got licences to fish under the agreement. The catches include e.g. mackerel, sardines, sardinella, cephalopods (see complete list below). However, the catches could even be somewhat higher. Both because the member states sometimes often do not report sufficiently, but also because some parts of the Western Sahara waters fall outside of the 34.1.3 zone. The data presented by the Commission do not include those catches taking place in the northern part of Western Sahara, between the southern border of fishing area 34.1.1. at 26 degrees north, and the internationally recognised border between Western Sahara and Morocco at 27 40 degrees north. The rules in the EU on reporting on catches specify that the member states must supply data on the amount of each species caught within certain areas. For statistical reasons, the oceans are broken down into relatively small pieces. The new fisheries partnership agreement with Morocco has been in effect since March 2007. Under Article 18(2) of Regulation (EEC) No 2847/93(1) ('Control Regulation') and the detailed rules for its implementation (Regulation (EC) 500/2001)(2), the Member States are required to supply the Commission with catch data 'broken down by third country and stock by reference to the smallest statistical zone defined for the fishery concerned'. CECAF Subdivisions 34.1.1, 34.1.2 and 34.1.3 are the smallest zones defined for these waters. Could the Commission please provide data on catches under the current agreement with Morocco for the period ending 31 December 2007 (or the latest period for which the Commission has received catch data), specifying what quantities were caught in each of the CECAF subdivisions off the coast of Morocco and the Western Sahara, i.e. 34.1.1, 34.1.2 and 34.1.3? Please provide the data broken down by species of fish (including molluscs and crustaceans), by Member State and by type of fishing (Chapter VI of the Moroccan agreement requires Member States to provide quarterly reports of catches by 'type of fishing', which presumably means according to the six categories of fishing in the agreement). If the provisions of the two regulations cited above do not apply to the current Morocco agreement, could the Commission please explain why not and what legislation applies in their place? (1)	OJ L 261, 20.10.1993, p. 1. (2)	OJ L 73, 15.3.2001, p. 8. Article 18.2 of Council Regulation (EC) No 2847/93 (3) states that Member States shall collect and communicate the catches by their vessels operating in waters subject to the sovereignty or jurisdiction of third countries, "broken down by third country and stock by reference to the smallest statistical zone defined for the fishery concerned". The figures received by the Commission pursuant to Article 18.2 for the year 2007 are given in the Annexes which are being sent directly to the Honourable Member and to Parliament's Secretariat. For Portugal and the United Kingdom, however, the figures did not arrive via the normal catch-reporting system and may therefore be incomplete. These Member States have been reminded of their obligation to both respect the normal communication procedures and confirm the total catches for their vessels for the year 2007. It should also be noted that certain Lithuanian vessels are currently fishing within Moroccan waters under private contracts signed before the coming into force of the EC/Morocco Agreement. The information and data received under Regulation (EC) No 2847/93 does not, at present, allow the Commission to automatically determine the fishing category under which the catches have been made. 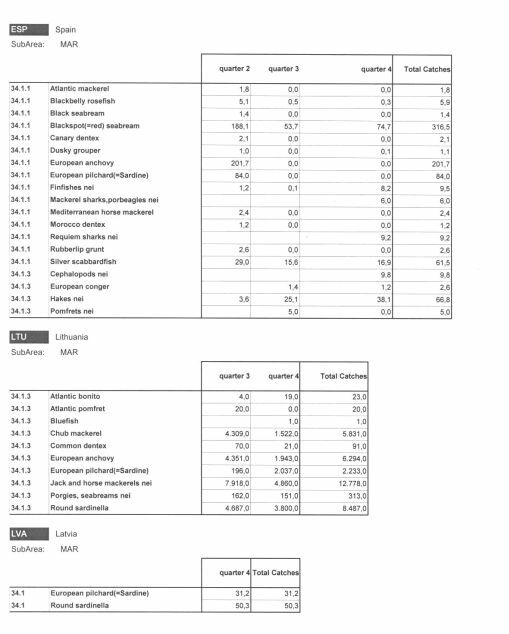 Efforts are ongoing to improve this situation and it is expected that, from 2009, these additional elements will be included in the statistics. (3) Council Regulation (EEC) No 2847/93 of 12 October 1993 establishing a control system applicable to the common fisheries policy, OJ L 261, 20.10.1993.